After his father was killed, T’Challa (Chadwick Boseman) takes his place as the king of Wakanda. As king, T’Challa is also given an elixir made from the heart-shaped herb. This elixir grants him superhuman speed, agility, and strength, allowing him to become the Black Panther. As a gift from the Panther God, Wakanda is the world’s source of vibranium. Vibranium is said to be the strongest metal on Earth, but it is so much more. Vibranium has allowed the Wakandans to create technology not otherwise possible. The Wakandans have protected the vibranium since they first received it. Having previously stolen some vibranium and as the man who killed T’Chaka (John Kani), Ulysses Klaue (Andy Serkis) is wanted by the Wakandans. When they learn of Klaue’s location, T’Challa, Okoye (Danai Gurira), head of the Wakandan guard, and Nakia (Lupita Nyong’o), a Wakandan spy, head out to capture Klaue. After he is captured by CIA agent Everett Ross (Martin Freeman), T’Challa waits to take Klaue back to Wakanda for trial. Erik Killmonger (Michael B. Jordan), a former black-ops soldier who has extensively studied Wakanda, frees Klaue as they attempt to go to Wakanda to steal its vibranium. T’Challa, Okoye, Nakia, and T’Challa’s sister Shuri (Letitia Wright) must find a way to stop Killmonger before he destroys Wakanda and sends their weapons into the world. Black Panther ties together story lines from Captain America: Civil War and Avengers: Age of Ultron while presenting us with an entirely new kind of superhero. The cast of Black Panther is simply amazing. Chadwick Boseman is a prince turned king who simply wants what is best for his people. While trying to protect his country, he is also doing what he feels best to protect the world from technology beyond what anyone has seen from falling into the wrong hands. He is torn over what is the right course of action. Danai Gurira is the head of Wakanda’s all woman guard. She is sworn to protect the throne, regardless of who sits on it. She takes her oath to the throne very seriously and will stop anyone who dares threaten it. Lupita Nyong’o, while as fierce as Okoye, she has a soft spot for T’Challa and is more loyal to him and his family. Letitia Wright, who serves as Wakanda’s technological genius, provides the gear T’Challa and his team need for their missions. She shows that she is more than just gadgets when the time comes. The rest of the cast include such talents as Forest Whitaker, Angela Bassett, Michael B. Jordan, and Daniel Kaluuya. Not enough good things can be said about just how well everyone worked together to bring the story to life. One of the best things about the film is that we aren’t simply handed another backstory. The history of Wakanda and vibranium are given as a voice-over as the film opens. It gets it out of the way and moves on with the story. Quickly moving on to the action, director Ryan Coogler doesn’t spare character or story development for special effects. He focuses on the relationships between T’Challa and his family and the people he rules over. 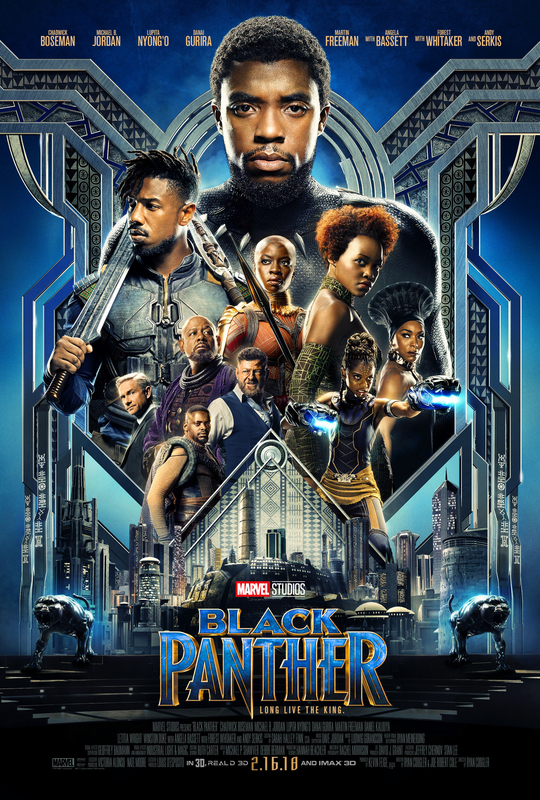 Showing a heightened maturity over other Marvel films, and superhero films in general, Coogler weaves a tale that will keep you on the edge of your seat, gripping the armrest as the tension builds. That’s not to say the effects are an afterthought. They are exactly what you expect from Marvel and Disney, even taking it up a few notches. Every inch of the screen has been well thought out and beautifully designed. I’m torn between recommending going for a 3D showing or a 2D IMAX. There is so much to see that the bigger screen would be better, but the 3D is so well done, it’s hard to recommend against it. On the heels of Marvel’s funniest movie yet, Thor: Ragnarok, which was the best to date, Marvel knocks it out of the park with its most grounded film. An absolute success in the superhero genre, and a great movie in general, Black Panther has taken the top spot on my list of Marvel movies. In an age where representation has become increasingly important, with Wonder Woman last year and now with Black Panther, more kids have a hero they can relate to and look up to. It helps that both of these movies surpass most others in the genre. You definitely don’t want to miss Black Panther.